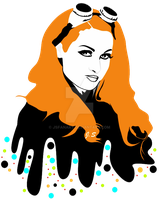 Digital Drawing of WWE's resident "Lass Kicker", Becky Lynch! Definitely one of my favorite Divas!!! Not a problem. Watched the video and I was very entertained!! Yay! I'm so happy! Thanks for watching the video!!! Incredible work! I hope Charlotte's next! Thanks! That's definitely the plan! Either her or Natalya but I already have all the references for Charlotte so it'll probably be her next!